Change things up with these side-trips from Perth: Caversham Wildlife Park (in Whiteman) and Fremantle (Fremantle Prison, Western Australian Maritime Museum, & more). 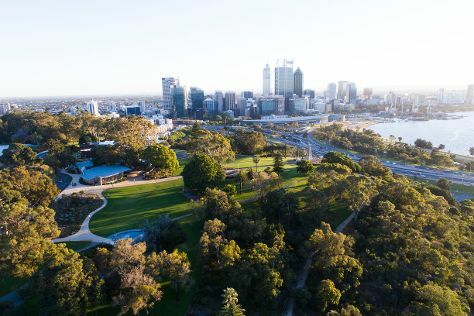 Next up on the itinerary: stroll around Kings Park & Botanic Garden, pause for some photo ops at Firefighters' Memorial Grove, contemplate the long history of The Perth Mint, and explore the activities along Swan River. To find maps, reviews, more things to do, and other tourist information, read our Perth trip itinerary app . Brisbane to Perth is an approximately 8-hour flight. You can also do a combination of bus and flight; or drive. The time zone difference when traveling from Brisbane to Perth is minus 2 hours. Traveling from Brisbane in April, Perth is slightly colder at night with lows of 15°C. Wrap up your sightseeing on the 28th (Sun) to allow time to travel to Ningaloo. Start off your visit on the 29th (Mon): explore the gorgeous colors at Ningaloo Reef. Plan my trip to Ningaloo with suggested itineraries provided by Inspirock. Use the Route module to find suitable travel options from Perth to Ningaloo. In April, Ningaloo is somewhat warmer than Perth - with highs of 38°C and lows of 23°C. Finish your sightseeing early on the 29th (Mon) so you can travel back home.